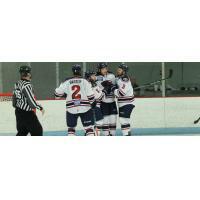 NORTH CHARLESTON, S.C. - The South Carolina Stingrays used a 4-goal second period to stake themselves a lead and never looked back, knocking off the Greenville Swamp Rabbits 6-4 in preseason action Friday night at the Carolina Ice Palace. Four SC skaters had multi-point nights led by defenseman Tim Davison, who scored twice in the contest. Forward Bo Brauer had a goal and an assist, while Jonathan Charbonneau and Luke Stork each secured two helpers. Both teams scored twice in the opening frame and the score was deadlocked at 2-2 after one period. Davison got the scoring started at 8:02 on the power play with assists from defender John MacLeod as well as Stork. After the Swamp Rabbits responded with a J.T. Henke tally, Matt Pohlkamp gave SC the lead at 9:36 with a goal that was assisted by his two linemates Christian Horn and Sam Fioretti. Stanislav Dzakhov evened the game at 2-2 before the period came to a close. South Carolina owned the second frame, outshooting Greenville 17-10 while scoring four goals in less than a five-minute span. Brauer, Jake Kamrass, Davison and Horn all lit the lamp and the Stingrays had themselves a 6-3 lead going into the third. Forward Jake Trask had the lone Swamp Rabbits goal in the middle period at 14:45. Greenville had the only goal of the third when Stathis Soumelidis scored at 3:29, but South Carolina didn't allow anything else to get by goaltender Parker Milner and held on for the victory. The Rays had the edge in shots on goal during the contest, 35-29. Milner earned the victory after stopping 25 shots, while Greenville's Jordan Ruby took the loss after coming in halfway thru the contest and making 13 saves on 17 shots. Netminder Devin Buffalo got the start in the game for the Swamp Rabbits and turned aside 16 shots while allowing two goals. Davison's man-advantage goal in the first was the only power play tally for either team on the night. SC finished 1-for-2 on the power play, while Greenville was 0-for-3.